6 Ways To Get Free Genealogy Help! Have you hit a brick wall while exploring your ancestors? Well, do not worry as there are ways that you can get free genealogy help. Here I will show you 6 different ways that you can utilize that will help you to discover that elusive ancestor. And by doing so you can then on with your research. These methods though have already been covered! If you have been following my site for a while you will know that I have explored each of these 6 different methods before. My main objective here is just to highlight the main points of each method. 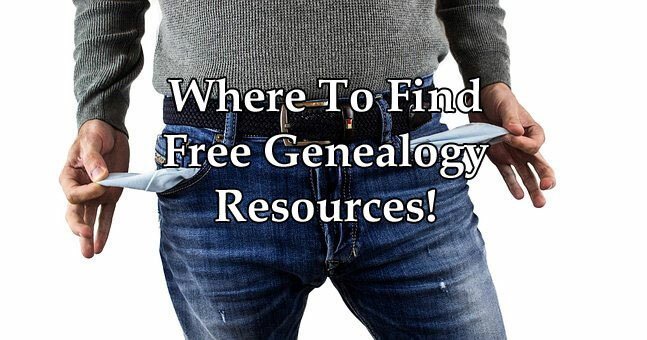 Since publishing this post I have added two more ways that you can get free genealogy help. Special thanks goes to Carol Hill who suggested that people join research communities. If you have any suggestions on please feel free to comment below. I would love to hear them. You have probably gained an interest in genealogy because of your relatives. That is where I became fascinated with my own family history as I heard many, many stories and tales that involved my ancestors. It was truly captivating what my father could recite to me. I knew that I would have to record them in order to keep their memories alive. Asking your relatives should be the second step that you will take on your genealogy journey, (exploring your own records will be the first step). They have countless pieces of information and material that they can pass on to you. Getting help from your relatives will save you both time and money. You will need to be considerate when it comes to interviewing them though. And also asking for any documents, materials or anything for that matter that may help you with your genealogy research. These societies are a goldmine of information. They will have local knowledge of the area in which your ancestors both lived and worked in. However, joining a family history/genealogy society is not free. There is an annual subscription that you will need to pay in order to gain membership, and also get discounts on publications that they produce. You don’t need to join! If you are not interested in joining these kinds of societies that is OK as you can still get the odd piece of information from them. It would though be in your best interest to join as like genealogy you just don’t know what you will find out from them. I have gleaned useful insights into the history of my ancestors by merely emailing the relevant societies and asking for help. They have often generously replied with information that was most useful to me. I would suggest that you do not go overboard and pester these societies. They will likely see that you are asking too much and will probably wish you to join in order to gain further information. Don’t forget that much of the work that they carry out is because of volunteers. If you access to a library near you then I highly recommend that you check it out. Similar to the method that I discussed above a library is also a goldmine of information that you can tap in to. The first thing that comes to mind when you think of a library is the books that they will have. A typical library will usually have a hobby section where you will probably find some books on genealogy. These books will help you understand what genealogy is all about, as well as discuss various other topics such as organizing your researching, how to use the Internet for your research, how to search for records that are out there, and so on. The computer is your friend! The second useful resource that is available to you at the library are the computers, which will have Internet access. And if your local library is like mine then they will have access to several genealogy resources that will help you with your research. At my local library incidentally I can log in to Ancestor and FindMyPast for free. These sites contain billions of records that I have freely accessed and used to extensively help build my family tree. I wouldn’t be where I am today with my near 2,000 strong family tree without this valuable resource. And finally your local library may have a genealogy group which have regular weekly meetings. From these sessions you can get help on how to find your ancestors. The instructors will be able to show you where to look and how to use resources online. These sessions usually last for an hour or two. Sometimes there will be guest speakers invited to attend and these are a great opportunity for you to get some very valuable advice. Touching on the previous method that I explored genealogy search websites contain billions of genealogical records, as well as millions of names and family trees. You may think though that you can only access this information for a price. You would be right there but there are instances where you can get information from these sites for free. Several of the top websites have typical 14-day free trials, Ancestry and FindMyPast spring to mind. There are also free weekends that pop up as well from time to time. This is usually around the holiday period. If you do want to take advantage of this free access I would suggest to you that you do have plenty of free time on your hands. You do not want to begin a free trial only to find that you do not have any time for your research. It will mean that you will have wasted the trial. Subsequently, when the trial period is over you will likely be automatically signed up to any one of the subscription packages that the site offers. Or if you do cancel before the trial ends when you do sign up again you will probably be disqualifies from pursuing the free trial. There are hundreds and hundreds of blogs out there that can help you with practically anything related to genealogy. Some will be written by experts while there will also be one by the amateur family detective. Either way these blogs, (mine included), can contain a lot of help that you can freely use. One such blog that I have recently discovered is suitably titled Free Genealogy Help. The site has been online since 2013 and covers topics such as how to use the FamilySearch website, books and sites that are of interest to the site’s creator Carol Hill, and where you can find records. And if you need any help then you can easily contact her with your question. My final method that I would like to suggest to you are what you would either call message boards or forums. In any case these are a great resource for you if you have hit a brick wall with your research. Similar to blogs there are plenty of these online, and the following link will show you the top 8 that I highly recommend that you check out. I almost forgot to add this method to the list, (actually I did and that is why it is a bonus). This method is pretty much similar to my library suggestion. Any archive that you will visit will have some kind of help and support. The staff that runs these centers can not only give you the records that you are after but they can also sit with you and help look with you. It really though does depend on the center that you visit and how the center is funded. If there is limited funded then this may mean that you will have to pay for a session with an archivist. But if you are in luck then you can book an appointment with a staff member and get excellent assistance for an hour or so for absolutely nothing. That’s right you do not have to pay a dime, (or penny). Firstly, I would like to thank Carol Hill, (who herself offers genealogy help), for suggesting this method. Research communities are also a great way for you to get help with tracing your family history and breaking down any brick walls that you may have encountered. The FamilySearch Research Help Communities is a collection of 12 communities where each of them can be found on Facebook. You just join the group that interests you and ask for help. Or alternatively if you can help someone with their research then please offer your assistance. Personally I wouldn’t be where I am with my research if it wasn’t for the kind help offered by others. So, please pay it forward and help someone out. I hope you enjoyed this post showing you 6 ways to get free genealogy help. If you have any questions or comments then please leave a comment below. How To Get A Free DNA Testing Kit! 10 Free Genealogy Sites You Need To Check Out! Where To Upload Raw DNA Data For Free! 6 Best Free Genealogy Software Downloads! 4 More Ways To Conduct A Free Ancestry Search Online! I just wanted to stop by and comment on what a straightforward and to the point post you have written! I look at quite a few Genealogy sites and I find they can be quite dry and boring, this article was concise and kept me reading to the end. I also love that you have the links to more detailed information if I wanted it! I have been researching my family tree for about 15 years now, and I go through stages where I lose interest – but reading this has given me a fresh lease of life and I think I will have a look for some Genealogy blogs to give me some fresh inspiration! I’ll be reading through your recommendations for good blogs in a few minutes. Thanks very much Jo for your kind words Jo. It really means a lot to me when people stop by and compliment me on this genealogy site that I am building. My aim with the site is to help people, (of all skill levels), to trace their family tree. And I aim to do that by presenting information, guides, tips, and more in an easy to read way. Not only that but I strive to make it easy for people to find what they are looking for easily as well. If there are any suggestions or topics that you would like to be covered on the site then please feel free to let me know. I am open to anything genealogy related. I help with the US South and the Southern Europe Groups. We have members join and ask us for help with their brick walls. It is amazing the help that they receive. You’re very welcome Carol. Thank you for your suggestion. I was aware of FamilySearch but I didn’t know about the research communities so thank you for sharing. I will definitely be adding this free resource to the post very shortly. Great guide! I think this will help lead to One True Family Tree. I can see this assisting Unity. We are all connected. Let’s regroove our minds to Truly believe that we are All Brothers and Sisters. Continue to take action towards your dreams and they will come true. No success can be achieved unless we truly believe in Ourselves. Thank you for your positive comment. You probably will be interested in reading my One Great Family Review. The creators behind this site also want to unite the world, and this a truly inspiring project. I like your ideas here because even though some are paid you offer some great free methods that I think are effective as well. I am going to have to check out your recommendation on the Free Genealogy Help blog. Your blog gives such great ideas on this topic and I can’t wait to see what is next. Yeah the genealogy sites such as Ancestry and FindMyPast are paid subscription. But there are a few tips here that I have discussed where you can get information for free. As I said it is great to save money by these methods. What you do save can be better use on other things related to genealogy. Very interesting topic. I have researched my genealogy but it is so difficult. Here I found good advice. I didn’t realize that there were ways that I could trace my ancestry for free. You are right it will save me money which I can then spend on other areas of genealogy which require money, I.e. subscription sites. You’re welcome Maja. Yes you can save money that could be better spent elsewhere. Also, on that note if you get help from your relatives you may find out details about your ancestors that you may not find elsewhere. All the best with your genealogy research. I’m getting on quite well with finding my way round the various sites and methods that you speak of and I found your personal tips good. I do still have a problem though, that I just can’t figure out how to get around. I have found the birth and death records for two people and their marriage record but how do I find out if they had children? The problem is that I have been told that they had two sons who may even still be alive, but I have no idea of their christian names to find any birth records for them. What do I need to look for if I am to find out about their sons? I’ve tried looking at other family trees but there is nowhere that this is recorded. Depending on when they were born maybe census records could help you. If you are up in the U.S. then there is the 72 year rule which means the most record would be 1940, and for the U.K. it would be 1911. Have you tried to find birth records that includes the father’s full name? You can have a reasonable search around the time of the marriage, maybe the same years, up to a few years after. Also, the births may be in the same location so that can help you limit your search. You may want to look at naming patterns. Maybe the sons took the name of their father, grandfather on both sides, or even uncles. That’s definitely worth a shot. Finally, you may want to check out newspaper archives. From old newspaper articles you can find birth notices and other events/incidents featuring the people that you are looking for. That is also worth checking. Hope these tips help you. I wish you all the best finding the two sons. This is a mine of brilliant information. I had already done the 14 day free trial with Ancestry, but wasn’t that keen on paying for research I can do for free elsewhere. I’d not heard of FindMyPast so I must check that out. I will also follow up your recommended blogs and forums too. I have bookmarked your site – I can see I will be returning often as I dig deeper into my families history. Thanks again for sharing. really helpful.